It wasn’t what you intended when you got behind the wheel, but it is what happened. Instead of arriving safely at your destination, you were in a horrific car crash that caused you to suffer serious burn injuries. Since you can’t go back and undo the harm that has been done, now is the time to focus on understanding your burn injury and your potential legal recovery. First degree burns. First degree burns only affect the top layer of the skin which may be red and sensitive. In most cases, first degree burns can be treated with basic first aid unless the burn occurs on a sensitive part of the body or covers a large area of the body. Second degree burns. A second degree burn is also known as a partial thickness burn. The first and second layers of skin, the sweat glands, and the hair follicles may be impacted. The skin may appear wet, red and blistering. The pain, the risk of scarring, and the risk of infection are worse than they are with first degree burns. You may need medical attention. Third degree burns. A third degree burn, or full thickness burn, impacts the first three layers of skin and may impact nerve endings. The skin may appear dry, charred and swollen. Third degree burns can result in extensive scarring and require medical treatment. Medical treatment may include hospitalizations, surgeries, and medications. Fourth degree burns. This is a very serious type of burn and it affects all layers of the skin and muscle. Many fourth degree burns are fatal and emergency medical treatment is necessary. It is important to make sure that you receive appropriate treatment for the specific type of burn that you suffer after your car wreck. Debriding to remove dead skin and tissue. Other things such as special diets may also be required. Your treatment may occur in your local hospital, in a specialized burn unit, or on an out-patient basis, depending on the severity of your injury. 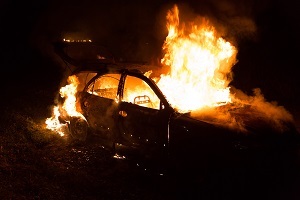 Many car crashes that result in burn injuries occur not due to the wrongdoing of the burn victim but instead because of a mechanical defect or a collision caused by someone else’s negligence. An experienced car accident lawyer can help you get the full and fair recovery that you deserve by conducting a thorough investigation to determine who is liable for your injuries and by holding that person or company accountable. To learn more, please contact us today via this website or by phone to schedule your free case evaluation.